Garakh is an Orc blacksmith living in Largashbur, the Orc stronghold of the Rift. During the day she can found smithing in and around the shack with the forge, though she will not buy or sell goods (see bugs). At night, she goes into the longhouse to eat and sleep. She wears scaled armor with a pair of scaled boots and is armed with a leveled war axe, which may be up to Orcish in quality. She may comment on her smithing: "Only a true Orc knows how to temper Orichalcum properly. ", "The old traditions are passed down from one generation to the next. The secrets of smithing are passed down as well. ", and "Every blade I make honors Malacath. Every rivet, every plate of armor is for him." She may also comment on her apprentice, Lob: "Lob will one day take my place, and bring honor to our tribe as I have." Lob himself will comment on Garakh's instruction if she is still alive, saying: "I learn much from Garakh every day. I must learn if I am to take her place." During The Cursed Tribe, Garakh will comment on the curse that has befallen her stronghold: "We have angered Malacath, and so we must be punished." 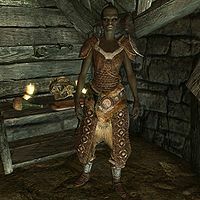 Garakh was apparently supposed to be the stronghold's blacksmith merchant, selling and buying blacksmith goods. However, a faction was not created to connect her to her merchant chest. This issue has been addressed by version 1.2.5 of the Unofficial Skyrim Patch; once fixed, he is affected by Master Trader, but not Investor.